Use express delivery service, so that your items arrive to you in good condition. If you have not tasted a scone with jam and clotted or Devon cream, you have missed out on one of the greatest tastes! These thick creams are absolutely delicious, and are best explained as a cross between ice cream and butter. They can be stored in a cool place without refrigeration unopened and they keep for many months. Once opened they should be consumed within 3 days. 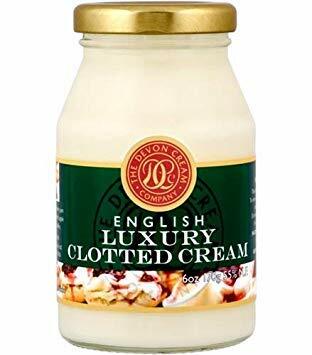 Product of England NON-REFUNDABLE, NON-RETURNABLE We would like to remind our valued customers of the option to ship clotted creams by expedited shipping so that they arrive to you in good condition. All of our food ships from Pittsburgh, Pennsylvania. Please keep in mind how hot the weather is and your distance from us when determining your shipping request. Thank you. Cross between ice cream and butter. Separation will occur, as noted on jar. Please stir before using. If you have any questions about this product by Devon Cream Company, contact us by completing and submitting the form below. If you are looking for a specif part number, please include it with your message.